TransLink is updating Transport 2040, with the current Regional Transportation Strategy (RTS) and we are looking for your feedback. 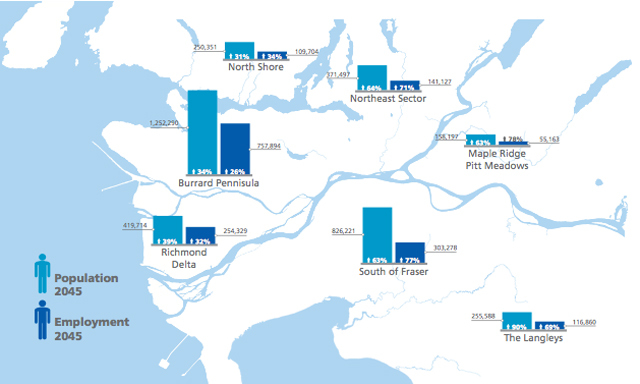 By 2045, Metro Vancouver is expected to welcome one million additional residents, adding 500,000 jobs and three million more passenger trips every day. We can’t have all of those people travelling the same way we do today and keep our quality of life. Improving our system in a way that protects our health, economy, environment and our future is more important than ever. To ensure that we can achieve all that our region aspires to and within the resources available, we need to start rethinking transportation. We are proposing an approach where we make the most of existing investments, and plan new ones around more walking, cycling and transit. At the same time, we need to provide more management measures, such as better information, regulation and pricing so people have the tools to make different travel choices. We are also committed to working closely with local governments to encourage community plans that locate jobs, housing and services closer to the frequent transit network. We have started a dialogue on this proposed approach and would like to hear from you. Please go to translink.ca/rts, to learn more and read the Draft Strategic Framework for Consultation. Between now and July 8, 2013 you can share your perspectives via an online questionnaire. Your input is important to us, and will help us finalize the strategic framework and develop an implementation strategy that includes investment options for the future. This is just the beginning. We will continue this conversation in the fall of 2013. Missed it? Markus Moos and Gil Peñalosa’s Rethinking Transportation talks are now online! Hey translink, Road Pricing is definitely needed! Though public opinion is likely negative before the initiative, take the courage and stand up for a better more sustainable region. Public opinion will definitely sway in support, but only if it is done fairly across the region. And one more thing: Car Mode Share is decreasing across the region! No need for a new pattulo and greater capacity across the fraser when car trips are going down, and there are alternatives on both sides! Remember the law of induced demand. I can’t believe I’m saying this, but I agree with road pricing. The issue is that we still need this infrastructure. We need to build it, toll or no toll. If we plan our region right, we won’t have to play catch up in 50 years like we are now with Gateway. One idea I’ve thought about is discouraging the use of vehicles for short trips while not punishing those who use a vehicle to go further distances. Do this by creating ‘zones’ for cars and setting up gantries at all the accesses to these zones. If a car travels from Whalley to New Westminster, the owner would be tolled for crossing the Pattullo because SkyTrain is available and easy to use. However, if that same car is spotted entering Vancouver at Boundary, the toll would be reduced or even eliminated as transit between the two areas is not as convenient to use as the former example. Another example might be a vehicle that is tolled for going from Burnaby to Coquitlam, but not for ending a trip in Maple Ridge. Other shaping can take place too. Toll vehicles originating in Richmond for traveling to South Surrey, but don’t toll trips to South Surrey that originate in Ladner. Trips that leave Greater Vancouver entirely would not be tolled at all, be it on the Sea to Sky, at the border, or Mission. Road pricing would be eliminated altogether at night as little to no transit exists during the wee hours of the night. Start charging at 5am and ramp up the tolls as the rush hour progresses, reducing them during the midday, but increasing them again as 2pm rolls around. Basically, encourage transit use where that mode exists and stop punishing users that have no alternative but to use a car. They will obviously know where you are, where you’ve been, and the times you travel anywhere, your speed, etc. Big Brother on steroids. Well, ideally, your information would be scrubbed as soon as you’re sent the bill and given a chance to dispute… e.g. : a month. But I see how, even with that precaution, the idea of Big Brother would be a concern. The logic and the technology is here to provide fair road pricing in the manner I described… implementing it so it doesn’t sound like a page out of 1984 is a whole other matter, I suppose. People would drive from Surrey to New Westminster to do what they want, and then drive to Vancouver, and then do a u-turn, and then go home. The extra gas is hardly a deterrent, and would probably be cheaper than paying the fine. Even if it were cheaper to pay the fine, then who cares? They wouldn’t have to drive to Vancouver, so it would be a great deal. Also, some people actually do many errands in 1 outing. The system gets complex, when trying to factor in the idea that somebody might go to New Westminster, and then drive to Vancouver 6 hours later. Also, I don’t see why longer trips should be given a break. They use more road, so they deserve to pay more. Why should I pay 3 zones, while some turkey gets to drive the same distance for free?? Finally, bear in mind, that never once did transit factor into this decision. People will fight it tooth and nail, and I am confident that Translink will encourage them to drive. I remember that Translink gave out cash as a prize and/or gas money. That is unbelievably insulting. Well, time limits would apply. After a certain period of time, the starting zone would be reset, so someone from Surrey who attempts to do what you described would be recorded as starting in Whalley and ending a trip in New Westminster. Then, a new journey from New Westminster to Surrey… while being charged for crossing Boundary Road in Vancouver. Longer trips should be given a break when transit between the end points is unfeasible to use. Expecting someone to use transit to get from Stevenson to Maple Ridge is ridiculous. Sure, the network exists and it can be done, but the difference between taking transit and driving is over one hour! This is a common theme with our transit system. Travelling between the suburbs, especially south of the Fraser and east of North Road essentially means you have to add an hour to any trip taken on transit. And that’s not counting any waiting. 30 and even 60 minute frequencies for buses in these areas are not uncommon. We don’t have the means to get people from point a to point b in a reasonable amount of time in many circumstances. Using a personal vehicle to fill in the gaps is not a villainous thing to do.